We need such a weapon for beachhead invasions … we have already solved its technical problems. EVEN at the outset of our World War II campaign of island conquest in the Pacific, it became evident that some form of armor was needed to spearhead landing operations. The old technique of wooden landing barges and surf-spattered Marines was obviously inadequate. To pit unprotected flesh and blood against an array of underwater obstacles, mines and wire entanglements, backed up by well concealed and heavily bunkered machine-gun nests, mortars and artillery, was a murderous waste of expensively trained men. belt. It was redesigned hurriedly in light armor plate, armed with forward firing machine guns and given the designation LVT (Landing Vehicle Tracked). It had an armored pilot house forward and a large, open cockpit accommodating 40 fully equipped Marines who promptly nicknamed it their “Invasion Taxi.” Able to . swim, scramble over coral reefs, negotiate soft beaches, swamps and mudholes, and bull their way through jungles, the Alligators were hailed with joy and were instrumental in saving thousands of Leatherneck lives. Good as it was, however, the Alligator was not good enough. Its water speed was low, making it an easy target. Then, too, its armor was too light to turn anything larger than machine-gun bullets and the crowded cockpit was an open invitation to shell fragments. An improved model, the LVT (A)l (Landing Vehicle Tracked, Armored), was the next step. The idea of an “amphtrack” or armored landing barge designed to carry assault troops to the beach was abandoned in favor of a more heavily armored assault machine carrying only its own crew. The Water Buffalo, as it was christened, was decked over like a tank and packed a 37-mm. cannon in a revolving turret. In . addition, two shielded .50-cal. machine guns were mounted on hatches in the after deck. Far more formidable than its predecessor, the Buffalo could mop up shoreline machine-gun and mortar nests before a single soldier hit the beach. In later models, a 75-mm. howitzer was substituted for the 37-mm. gun which made the steel monster still more potent. This was the weapon with which we wound up our war in the Pacific. It is still the navy’s specialized instrument for amphibious landings. However, it is not the final answer. Slow in the water, forced to cover considerable distances in plain view of defense batteries, the Water Buffalo is more or less of a sitting duck for enemy gunners. Because it must float, it is of necessity less heavily armed and armored than its land counterpart and consequently less able to withstand defensive bazooka and recoilless-rifle fire. A better solution is important to any counter-offensive problem in modern war as was proved in Korea, where a series of landing operations was necessary. Just what kind of a weapon is needed? Obviously, it must be something bold and unconventional, for we have almost exhausted conventional means. Fast, armored landing craft have been tried but they still spill unprotected men on a fire-swept beach. They have their place, certainly, but only in followup waves of attack. Larger and more rugged descendants of the Buffalo would be better able to withstand enemy fire while afloat but would prove too unwieldy for subsequent land operations. Land tanks might be floated ashore on detachable, self-propelled pontoons. Like other surface craft, however, they are subject to heavy defense fire during the process. And if one of the pontoons were hit and opened, its tank would head for the bottom like a huge, steel sinker. You may be closer to the answer than you think. If an adequately armored tank is too heavy to float, why not let it sink to the bottom and roll up to the beach under water? It needs only suitable sealing, a temporary air supply and a means of guiding it along passable, ocean-bed trails. Let’s take a look at the technical problems involved. The Alligator and Water Buffalo, plus several pre-war amphibious tank designs, have proved that watertight, armored hulls can be successfully combined with practical track gear. So far as underwater sealing, air supply and sea-floor operation are concerned, a working prototype already exists. 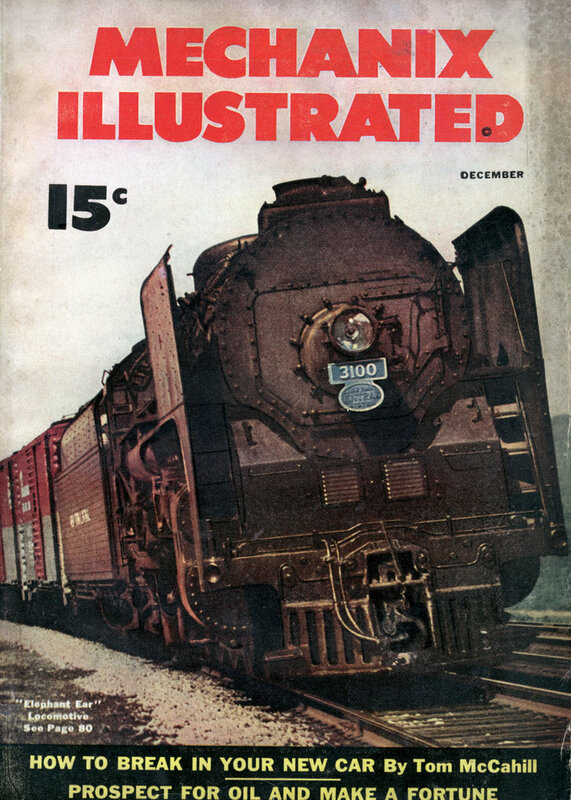 See the undersea explorer’s submarine in the June ’50 issue of MI. It is true that this machine is designed like a baby submarine with track gear. It has none of the armament, free-swinging turrets, etc., that a fighting tank requires. But those are problems that can be licked, tooâ€”if we really set our minds to it. The hull, with its escape hatches, air inlet and exhaust ports, presents no great difficulties. All have been long since solved in standard submarine practice. The main problem lies in the turret. Here we are faced with an entirely separate unit, mounting a heavy, long-barreled gun. It must be capable of 360Â° rotation and its gun must have a 90Â° elevation. Mounted on a motor-driven, ball-bearing traversing ring, it is difficult to render waterproof, especially since the gun and turret must be free to swing into action as soon as the tank emerges from the water. And whatever freeing is necessary should be done from inside the tank. If we can’t waterproof the turret itself, why not cover the whole thing with something that can be waterproofed! Let’s take our cue from aircraft design. The modern jet fighter faces a similar problem in a different medium. The pilot’s cockpit is like a fish bowl in reverse. Surrounded by the thin, icy air of extreme altitudes, it must be kept filled with heavy, breathable air, warmed to the proper temperature and enriched with oxygen. This means that the cockpit enclosure must be airtight, strong enough to resist wide differentials in pressure and transparent enough for good visibility. Also it must be attached so it can be jettisoned instantly to permit escape in an emergency. Here may be our answer. Anchored in a rim molded into the tank’s hull just outside the turret joint can be mounted a heavy dome of clear plastic enclosing the movable components in a rigid, waterproof shell. Inside this bubble-like canopy, the tank’s retractable periscope will revolve, giving its crew a full 360Â° field of underwater vision. Upon reaching the surface, the dome is blown clear of the tank by small explosive charges placed around the rim as in the standard fighter-plane enclosures. A suitable type of clear plastic, methods of fabrication, optical curves, rim fastenings, gaskets and jettison equipment are all available and easily adaptable to tank requirements. The sole remaining stumbling block is the long barreled, 90-mm. gun. Luckily for us, the rapid acceptance of the recoilless type of cannon solves this problem. Light in weight and comparatively short barrelled, this new piece of ordnance is made to order for tank use. With no recoil travel to consider, it can be fitted entirely inside the wide, dome-like turret, with just an inch or two of muzzle protruding. Using rocket-boosted shells with shaped-charge noses, its muzzle velocity and penetration is easily the equal of conventional anti-tank artillery. With a 105-mm. recoilless gun mounted in one side of the turret, a powerful flame projector balancing it on the other side and a battery of machine guns buried in an independently rotating top section above, our tank is more heavily armed than any existing model. And all these stingers can be housed compactly beneath the waterproof dome. In the drawing on pages 74 and 75, the tank is shown with side fenders which can be raised during land travel to act as seats for soldiers or for carrying equipment. Our tanks would arrive off an enemy coast in standard, sea-going LSTs. As in wartime landing operations, the top deck would be packed solid with jeeps, half-tracks and trucks loaded with fuel, ammo and supplies to implement follow-up tank assaults. Like Europe of an earlier era, we are involved in a life-and-death struggle against the craftily led hordes of Asia. We cannot hope to match them in sheer man power. Our only chance to beat them is with superior weapons and know-how. A combination of western science, Yankee ingenuity and the willingness to try anything, is our only hope. 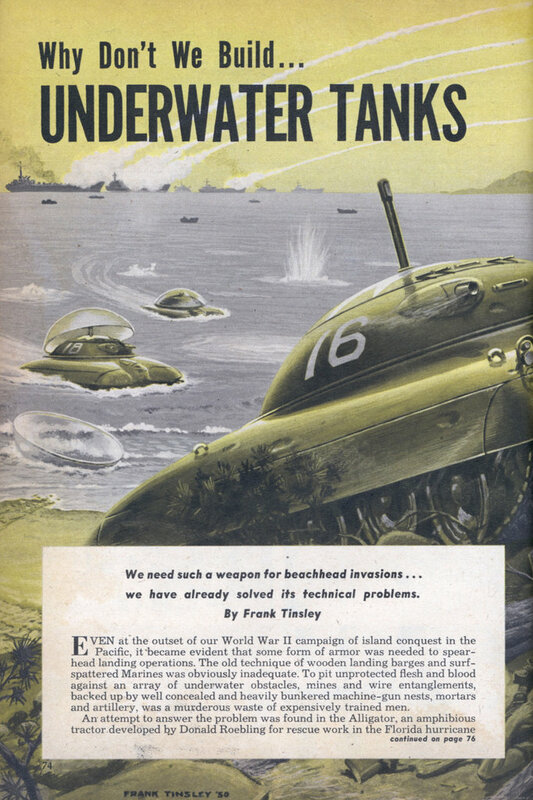 An undersea tank may prove to be one of the weapons we need. Why don’t we have it? Can you imagine how impressed the chicks would be when you drove that thing up on the beach? Oh yeah, baby!